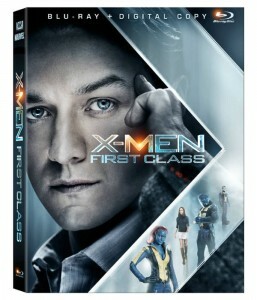 20th Century Fox will release X-Men: First Class on Blu-ray Disc (with Digital Copy) and DVD on Sep 9, 2011. Bonus material includes two hours of interactive extras, deleted and extended scenes, talent interviews, featurette “Children of the Atom,” and 10 Marvel “X-Men” digital comics. A never-before-seen X-Men: First Class backstory is also included. The BD is presented in 2.40:1 aspect ratio with DTS-HD Master Audio 5.1 and features a BD-Live portal with additional “Tracker” profiles. X-Men: First Class stars Laurence Belcher as Charles Xavier, Jennifer Lawrence as Raven, and Kevin Bacon as Sebastian Shaw (otherwise known as the villainous “Magneto”). Pre-order X-Men: First Class (+Digital Copy) on Blu-ray from Amazon and pay the lowest price by the end of day on release date.